Streaming Devices Market size was estimated at over USD 5 billion with shipments of over 60 million units in 2016 and is predicted to grow at over 20% CAGR from 2017 to 2024. Growing dependence on the internet and the rise in video and audio streaming activities is driving the streaming devices market. The growing trend of integrating internet connectivity in everyday objects is a prime factor promoting the growth. These systems allow the consumer to stream video and audio content directly onto their TV systems without the limitations on the mobility and issues pertaining to the consumption of memory space. Furthermore, they also provide instant playback and allows the consumer to watch various streams at flexible timings, providing high advantages over traditional devices. Consumer reliance on the internet for every-day functions such as payments, education, and entertainment, is causing a shift away from traditional platforms to the digital realm. The market growth is further facilitated by governments of various countries increasing their expenditure on the development of supporting infrastructure for the provision of connectivity to a larger population base. The advent of smart TV solutions is a major obstacle impacting the streaming device market as these systems provide similar functionality to media streaming devices. However, higher access to content, ease of updating the software, and relatively lower-prices of these devices is balancing out the impact of smart systems. The presence of regulations regarding copyright issues and content piracy is further hindering the market. Various countries in Middle East and European regions have stringent regulations regarding the tight control on the data being streamed. Certain countries such as South Africa are in the process of considering a ban on Over-The-Top (OTT) video on demand services such as Netflix. Streaming devices market trends indicates that the USD 30 – 100 price range is anticipated to hold the largest market share during the forecast timeframe. This is largely attributed to the consumer inclination towards consumer devices that provide high functionality and convenience at lower cost. Price range of USD 100 – 250 is anticipated to experience high growth during the forecast timeframe owing to the advent and rising prominence of new and advanced technologies such as 4K resolution systems. Devices in this range provide higher functionality and can operate on a larger number of systems. Players in the industry including Google and Apple are increasing their focus on offering devices inbuilt with 4K technology to enhance the customer experience of using the media streaming players. 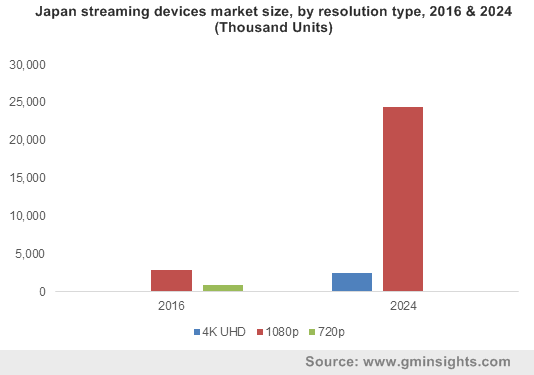 The streaming device market segmented by resolution type indicates that 4K compliant systems are anticipated to account for the largest growth during the forecast timeframe. Consumer demand for high higher picture quality and the declining prices of 4K screens is projected to replace lower resolution screens by 2024. Additionally, 4K systems prices experienced a decline from approximately USD 8,000 to USD 1,250 from 2012 to 2015 and will continue to do so in the following years positively impacting the 4K technology demand across the globe. The penetration of low cost, high quality systems in consumer and commercial verticals is a major factor promoting the large hold of the market on the global landscape. At present, majority of the digital data content is designed to run effectively on a fully HD, 1080p systems. These systems also have the capability to eliminate the issues of obtaining a grainy picture and allow high quality picture viewing at any distance away from the screen. High penetration of the fast broadband and connectivity solutions is contributing to the increased adoption in the U.S. and European region. For instance, as of June 2017, approximately 80% of the European population has access to continuous broadband services. Furthermore, the rising movement away from satellite and cable TVs to the digital platform is anticipated to drive the streaming devices market in these regions. The U.S. accounts for the largest subscribers to OTT video streaming and pay-per-demand services such as Hulu, Amazon Prime, and Netflix. In June 2017, Netflix announced that it had over 50.85 million subscribers. The Asia Pacific market provides high potential for growth with a CAGR of around 25% during the forecast timespan owing to the improvements in the economic conditions, primarily in countries such as China and India. The economic boom in this region is aiding the middle-class population to purchase luxury and high-end products with the increase in disposable income. 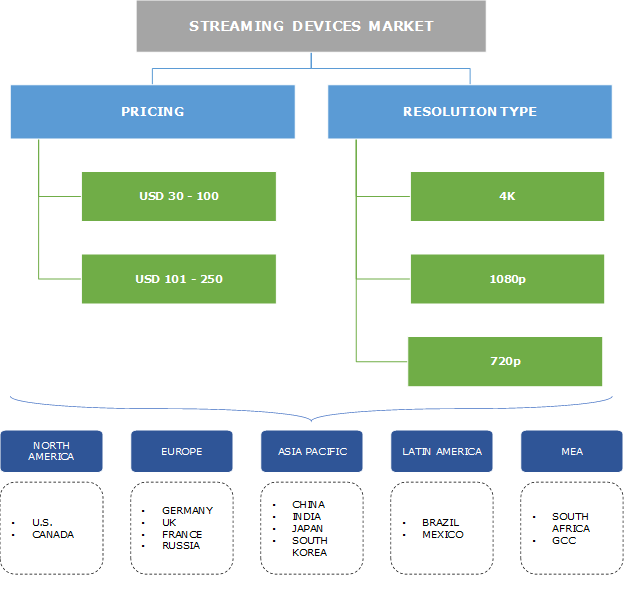 Vendors in the streaming device market include Google LLC, Amazon.com, Inc., Logitech International S.A, Humax, Apple Inc., Intel Corporation, Nvidia Corporation, Roku, Inc., and Xiaomi Inc. The constantly changing technological landscape such as higher HD systems and the evolution of consumer media viewing patterns is causing industry players to invest heavily in business strategies such as product innovations, mergers, and acquisitions to sustain growth in the market. For instance, in July 2016, Google announced the acquisition of Anvato that provides expertise and tools for the streaming, editing, and delivery of OTT video. The market comprises a substantial number of local players which hold very small market shares and a few large players that hold over 75% of the global marketplace. companies generally offer a limited range of products that are specifically built to cater to a specific resolution type. As technology advances at a very rapid rate, companies are required to continuously innovate to sustain growth. Demand for wireless systems is projected to fuel the growth of the streaming devices market owing to their increased conveniences and the elimination of the hassles of maintaining multiple wires. With the adoption of Streaming devices technology, consumers can eliminate the costs associated with the installation and the need for replacements when the connective wires are damaged.